How Do You Care For Your Disabled Customers? Meet one of your customers, Joe. Joe is profoundly hard of hearing, which means he is incapable of registering any sound under 91 decibels. This means that it is very difficult—if not impossible—to communicate with Joe over the telephone. Customers like Joe have the same pressing needs as any other patron , though. So how can you serve them without using the telephone? The answer is through Web conferencing. By using a Web conferencing platform like Onstream Meetings, you can use a combination of text and video chatting tools to exchange information in real-time. When leveraging video conferencing, a customer service agent can carry on a meaningful conversation by utilizing sign language, a tactic that would prove futile over the phone. Onstream also makes it easy to exchange a variety of graphics, which can enhance dialogue and make it easier for customers to understand information as it comes from an agent. These graphics can be easily stored in a cloud-based content library, so that agents can extract them with little to no hassle during a conversation. That’s not all Onstream can provide, though. In tapping the company’s closed captioning service, you can also make it easier for those with disabilities to understand your live webinars and webcasts. This is especially useful for federal organizations, or those seeking federal funding, that must offer such services to remain in compliance with sections 504 and 508 of the Rehabilitation Act. So, do you have the ability to offer first class customer service for your customers? 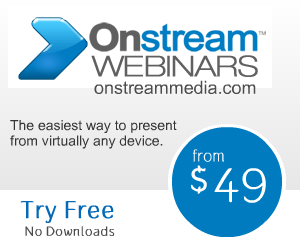 Click here to get started with Onstream Media today.